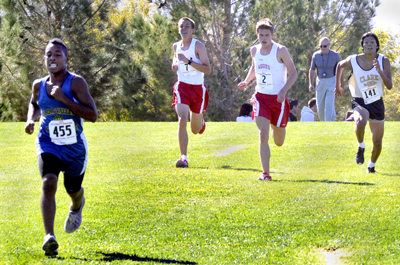 STEVE ANDRASCIK/LAS VEGAS REVIEW-JOURNAL Spring Valley High School runner Denzel DeCaires (455), left, is followed by Arbor View runners Justin Miller (7) and Shelby Decker (2), and Clark runner Ulises Concepcion (141), as they sprint for the finish line while competing in the 2011 Southern 4A Sunrise Boys Regional Championship cross country race at Veterans Memorial Park in Boulder City, on Friday, Oct. 28, 2011. Friday’s Class 4A Sunset Region boys cross country race was over almost as soon as it started. Defending Class 4A state champion Nick Hartle led from the start and never was threatened, extending his lead throughout and winning the 3.1-mile race in 16 minutes, 11.9 seconds at Veterans Memorial Park in Boulder City. Hartle’s time was just more than seven seconds off his course record, and he was the only runner to break 17 minutes in either of Friday’s region meets. But Hartle was happiest about his team’s first-place finish, as the Bulldogs captured their fifth consecutive Sunset title with 38 points. Hartle wasn’t as enthusiastic about his individual finish even though he was nearly a minute faster than teammate George Espino, who placed second in 17:06.0. 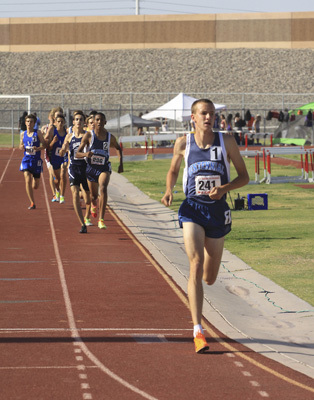 Josh Holland of Bishop Gorman finished third (17:19.4), Centennial’s Jackson Carter was fourth (17:26.5), and Frankie Martinez of Desert Oasis rounded out the top five (17:30.0). The real battle was for the second berth at next week’s state meet in Reno. When Bishop Gorman’s Jacob Holland —Josh’s twin brother — and Eric Klein finished sixth and 10th, it gave the Gaels three runners in the top 10, and all three finished before the top runners from Palo Verde and Shadow Ridge. It was enough, as the Gaels finished with 87 points to edge Shadow Ridge (91) and Palo Verde (93). Youth dominated the Sunset boys race. Of the top seven runners, all but Hartle, a senior, were freshman and sophomores. The girls race also was a runaway for Centennial. Sydney Badger won without a challenge, extending her lead throughout and winning in an excellent time of 18:57.4. Only one other girls runner broke 20 minutes in either region meet, and that was Palo Verde’s Marissa Suan, who finished second behind Badger in 19:55.8. Andrea Gonzales of Arbor View finished third (20:17.7), Hannah Pavlov of Faith Lutheran was fourth (20:29.5), and Savannah Anas of Centennial (20:34.3) was fifth. Centennial’s girls made it a Bulldogs sweep, winning the team title with 46 points. Arbor View was second with 73 to claim the other state berth.